which looks too good to be true. Does anyone have one of these or an alternate and what are the pros and cons of the machine you have ? What is the best UK website for info on these devices? The idea of being able to produce custom gears and other small parts in nylon/abs seems very attractive to me. More than happy with my Da Vinci 3D printer. A couple mods and now I use aftermarket filament. That one looks a tad under whelming. I get the impression that any of them will produce pretty looking "prototypes" but you'll likely need something better than a budget model for working parts. If possible try a get some actual samples before committing. Surface finish from some of them also leaves a bit to be desired. I looked at the Da Vinci one but was put off by the need to use filament cartridges. My limited research has shown that some very exotic materials are now available, and that nylon can be used with little alteration. The two up is very much a budget machine, but from what I have read may be too troublesome. I am now considering a Prusa i3 kit, which has a water jet cut aluminium frame. As you can specify the extruder head, I can select one which will do the higher temperatures needed for stronger materials. The link to the kit is slow to load, http://semiu.co.uk/product/prusa-i3-complete-kit/ , the photographs are poor, however the information I can find about it seems to indicate that it will do the job. Will try to get some actual prints from the chap. AFAIK, the surface finish is determined by the nozzle size. 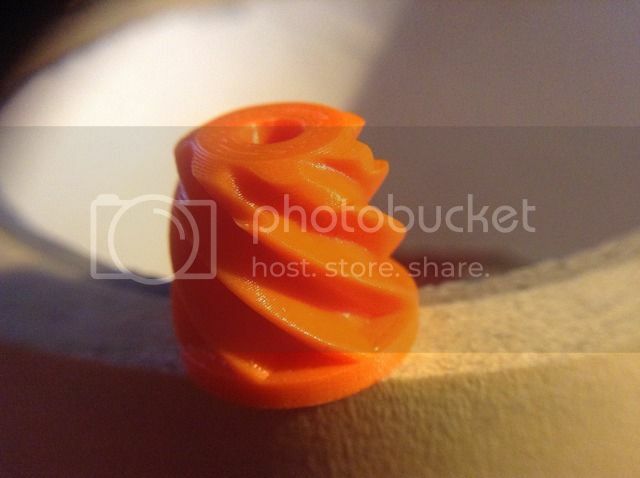 So a small nozzle size will give a good finish but will take a long time to print. The mechanical positioning resolution of the printer is 0.0125 mm in X and Y and 0.00025 mm in z. 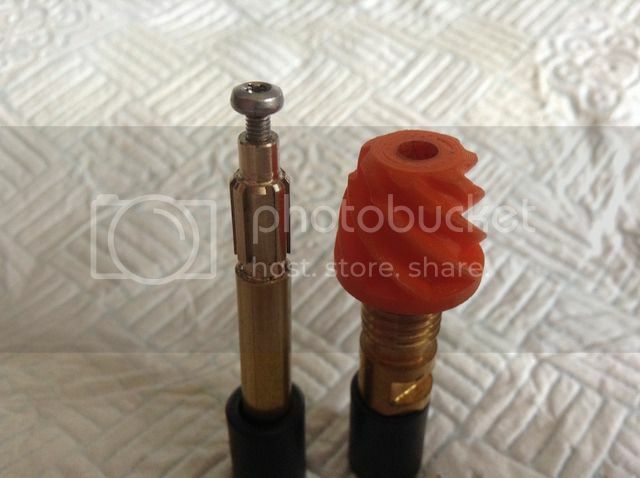 Intend using E3D-online v6 nozzle which will go down to 0.25mm. Still very much at the considering stage - far too much work on to do anything about it at this moment, but I like the possibility. I'll be extremely interested to hear how you get on with your investigations of 3D printers. It's my next intended acquisition once I've properly set up and got used to my laser engraver. Most of the 3D printers I've seen to date have been little more than toys (with a nice low price) or top end industrial kit using exotic materials and a matching price tag. I'm looking for something in between these extremes that can do useful work to a fair finish and reasonable working volume. Some modern microscopes have plastic gear in the focus mechanism. These fail soon after the microscopes get into the amateur community (presumably, professional users can afford their service contractors' charge to replace the gear). There has been some discussion on the Yahoo Microscopes group as to whether 3D printing is capable of making replacement gears with the necessary precision. My reading of the various posts, pro and con, is that the jury is still out. Having said that, the various posters aren't usually very specific about how much they've paid for their 3D printer. It may be that top-end machines can do it but the cheapies can't. Those ring gears are 62mm diameter and I printed them for destructive testing, mix the pinions and see where colours get transferred to improve the design if needed. These are going to be for an experimental extruder for another 3D printer. I use a lot of parts like this for prototyping and maintenance, PLA is very unreactive to solvents and oils. The printer these were made on cost £470. It's a Createbot Mini, however what makes this machine a gem is its welded steel chassis and direct drive extruder. All the cheap machines in the Prusa i3 vane suffer from rigidity problems and this in turn appears as lines and blobs on your prints where the machine is RINGING as it prints. You want something with a sturdy chassis and good quality bearings, not bushes if you expect any sort of life from it. I use this machine daily in my business and hobby applications, got through about 6kgs of PLA so far, or about 2.1km of filament so very happy with the extruder mechanism on this one. This is my machine. The downside is the lousy electronics it used, BUT even that is not insurmountable as they are pretty bog standard and can be replaced by off the shelf parts available in the UK. The gears look impressive although the surface finish looks a bit rough. This is one of the aspects I am concerned about, because as parts get smaller the roughness becomes a greater percentage of the part. Like the idea of using the different colours for a visual mesh check. At £400 your printer seems a very reasonable choice. Which software package did you use to design the parts? The mechanics of the Prusa kit seem fairly OK. It has 10 linear ball races used with precision ground rod (0.03mm) and a water jet cut aluminium frame, which to me looks pretty good. I don't think they could get the head position accuracy figures otherwise. The only part that concerns me is that the vertical metal plate (gantry) attaches to the base with just two nuts and washers to keep it vertical. To be fair there is no load to move it from vertical but the dynamic loads caused by the movement of the head may cause some accuracy issues here. If I go ahead with the purchase I will measure the repeat accuracy with a gauge and anything that I find which reduces it I will stiffen up with custom mods. It looks like just mounting it on a known flat surface with brackets at right angles to the gantry (vertical plate) would sort it. Don't be fooled by the surface reflections, that roughness is about 0.1mm that being the layer height. This is a close up of the pinion you can see the layers, the plastic is very slippy so little friction. Most prints can be treated as precision castings, PLA machines quite nicely and can be wet sanded with fine emory and then lacquered for a tough finish. The parts were designed in Rhino, and output as STL files I then used in Simplify3D, but you could use (Free) Cura for this. The Prusa is a bold claim considering they are using tie wraped pipe as couplings onto unsupported hardware store threaded rod. If you plan on building tall models, you aren't going to see 25 micron accuracy ! My software has rounding errors for Z so expect >0.1mm in say 50mm. I use the printing in association with my lathe and mill for precision parts, just like you would a casting. What is the smallest size gear you are trying to make ? By swapping to a 0.2mm nozzle you could expect a blob of accuracy 0.25mm x 0.25mm in X,Y even if your Z does 50micron steps. The blob size dictates your minimum detail, if that makes sense. Not suitable for parts like gears but I understand the surface finish can be improved cosmetically on some materials by giving them a wipe over with some type of solvent. 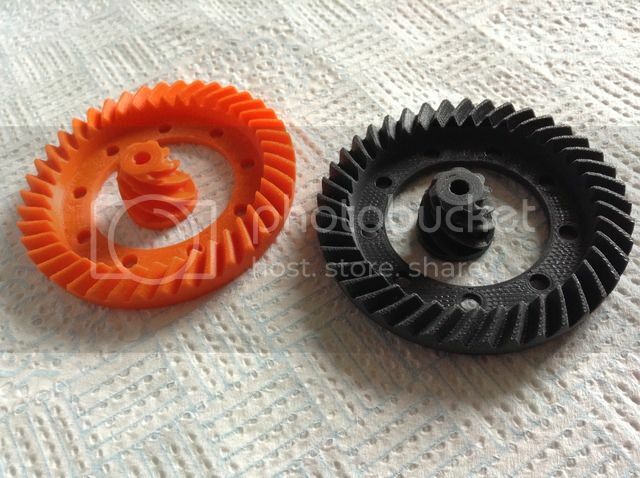 Plastic gears are often the weak link in some products. Two for no particular reason spring to mind and those are telescopic sights and milling machines! Thanks for replying. The surface roughness on that pinion gear looks really good - and the part about the blob size makes perfect sense. Finding that kind of info about surface finishes is quite difficult. I was less than enthralled with the coupling used for the z axis - seems strange that a conventional shaft adapter wasn't used. Having said that it appears that the ends of the threaded rod are supported by the motor spindle and the tubing is just to allow for some lateral or angular misalignment whilst providing rotational drive. Difficult to know how accurate it might be. LOL shock loading...... They do cushion the blow. These gears are meant for light loading applications or test prior to casting. You can do a lost PLA casting, and even print the gear oversize for shrinkage just by altering the software. They are a great "prototyping" tool and very quick to get a useable result that I personally couldn't machine. You can do a lost PLA casting, and even print the gear oversize for shrinkage just by altering the software. Joules, have you tried to lost PLA cast? Because even with lost foam (and therefore a much lower level of flammable material) it's not easy to get accurate thin section results with good fill, because the foam is burned up during the pour. I would definitely like to see those gears cast with a lost PLA process. Lost wax is an accurate process, but the wax is carefully removed from an invested mold before casting, it's quite different from lost foam. Lost foam is much more approximate and iffy for small intricate parts, and I imagine that lost plastic would pose even more difficulties... I'm talking about thin section complex and undercut shapes, a major reason for people seem to promote a 3D printer for pattern making at the home shop machinist level. 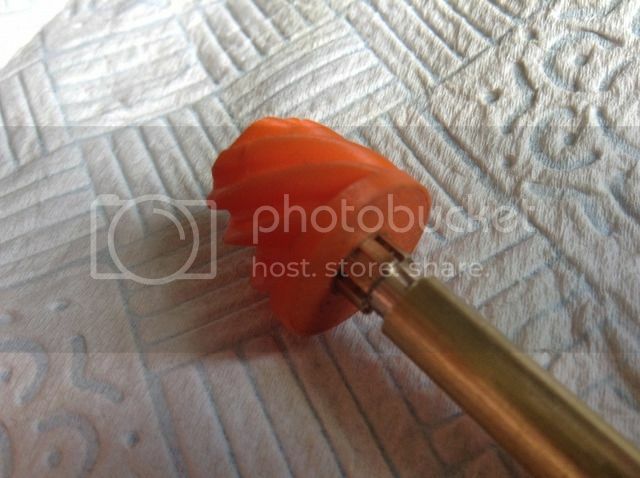 Now if the 3D printer made an accurate melt-out wax pattern, that would work with traditional lost wax casting methods. Perhaps that's what you mean? Just for information but the Da Vinci filament requirement is very easy to work around. I use aftermarket 1 Kilogram spools as do many others without modifying the software that is supplied by Da Vinci so that is not problem. You can set the layer height from .01 .02 or .03 and the print quality and density is also adjustable. As to the layer lines they can be flashed off with a little acetone if it offends the recipient though I see no need. Alas vtsteam, I have not cast anything but should have said lost wax style, not implied lost foam. The plastic is too dense to even contemplate molten metal burn out, even as a shell print. 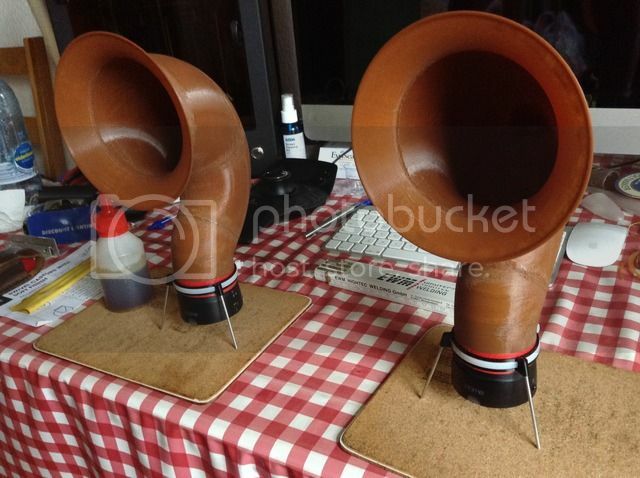 Anyone local to team up with for some lost wax style PLA casting experiments ? picclock, not sure if this one is outside your budget or a bit too big. Its a project E3D are involved in. I should have first hand experience of one in December if the project runs to plan. My mates getting one, it looks more promising in perspex than plywood. Best of all it will be Open Source after the Kickstarter. That looks quite a beast - I hope it comes to fruition as it looks the sort of thing I'm looking for. Joules, it seems to me that that a mold melt-out filament material should be pretty easy to do, actually, since the pattern needs no special strength or longevity and the temperature for the extruder can be moderate. The main requirement being that material be able to melt (and burn) out of an investment mold completely with no ash or residue, and ideally do so with low fumes. Recovery for recycling would be nice, so actually a filament isn't the ideal form, rather, a hot chamber. Seems like somebody ought to develop that, if they haven't already. I'd like to see someone here develop a DIY 3D printer using an available commercial head, since the rest of the machine is straightforward. I don't get why they are generally built so flimsy compared to, say, a simple CNC router. Welded square steel tube for the base structure, and lightweight but high stiffness traveling components -- aluminum or even epoxy coated box section birch ply structure for the gantry would have very high specific modulus. Basically light aircraft construction, would be the way I'd go. It seeems people are enamored of the concept of the machines building their own components so they try to design complex plastic structures, but plastic is so elastic it seems a bad idea to me. I realize birch is considered antiquated in our so-called high tech society, but it does have very good stiffness and fatigue properties compared to other materials, at low density, and I personally have no prejudices against mixing materials to achieve a superior performance goal. That's interesting, though I think a bit too large for me. I notice it uses the same head as the Prusa I3, along with 2 Z motors. Research on the internet has confirmed that unless you mount the prusa on something flat it will have to be recalibrated every time its moved. I know a guy who cuts stone kitchen tops to size and he has loads of scrap pieces in his yard. As we are likely to order our next kitchen tops from him I would think a granite or synthetic stone base would sort out that issue. The other thing I didn't like was that the end stops used on these machines are microswitches. Replacing these with opto sensors, especially the smd variety will give orders of improvement. Likely only really necessary on the z axis. Just need more hours in a day to get the time to play with this technology. vtsteam, you raise some interesting questions. Number one PLA is a consumable, whilst I hate throwing things away at least this one is biodegradable, eventually. One ring gear and pinion weighs 9gram. Printing with wax, I guess the problem is wax has a low viscosity when fluid and would be harder to meter from the head, it just doesn't behave like molten plastic. That said you could do a rubber mould of the printed part then shoot wax for lost wax casting, just seems a lot more work unless you plan on making many of them. Now the tricky bit. Printers... The technology has taken many years to reach the point we are at now, yes there has been obsession with getting the machine to make itself. I am not at all interested in that side of things, I am an end user with applications. The printer for small parts usually has to be an order of magnitude more accurate than a hobby cnc router, but at a push you could use one. Having an enclosed cabinet helps the consistency of layer building no end, it keeps the heat in and the drafts out that can cause warping and delamination. Again the printer is a huge compromise, you actually want a very light weight printhead so you can move it about rapidly without shaking the machine all over the place. Add to this the need for as close coupling of the feed motor to extruder. Bowden fed extruders are a lot more difficult to control than a direct drive, especially with flexible filaments where they easily compress. Printing has loads of variables that must be balanced to achieve good printing, it really is juggling with jelly that we tend to take for granted now the hard work is done. Hit a snag and you are back on the learning curve of how this all works, this is why I concentrate my efforts on PLA and work within its constraints for now. Printed nylon does not have the same characteristics as moulded or machined nylon, it may be touted as stronger but it ultimately depends on your end use and understanding of its limits, and we are back at compromise. picclock, the results of my morning in the workshop. Brass splined shaft made ready to fit pinion. Partly mated, they are a tight fit, I can remove the pinion without the printed splines being torn out of the pinion. This is a test part and something new I am trying, I am very happy with the result so far. The gear is centred with no slip on the shaft. Next up is design the bearing carrier for the two gears and then start load testing them. I have about 2 years 3D printing experience with current hobby machines, about 10 months on my Createbot mini. In my collection is a deltabot that I play with, but it is a whole different beast to this current one. Don't fret over some of the details in printing. That first layer is usually your most inaccurate as you are trying to lay a foundation layer that is usually thicker than those to come. A microswitch is adequate for sensing the bed home position. Granite slab, great idea that should be standard for ALL 3D printers and bolt them too it. Always plan how you are going to print something before you print it, each print in effect has grain that can work against you or for you in some applications. Don't be afraid to print something at an angle with support material, or break up a model into parts and weld them together at the end with a soldering iron. Like the above example. Guy's this is what I have learn't about printing and printers. It's my experience and my journey, yours will be different, always happy to answer questions where I can or just comment on what you see. Joules, I wasn't suggesting wax per se, but that a printer medium be deveoped that could be melted out of an investment mold before casting. Otherwise, the claims for using a low cost 3D printer to make accurate thin metal molding patterns for complex small parts like gears via "lost" plastic molding is uhhhh, let's say on "optimistc" side of the truth. I'm sure you can make simple shapes with a machining allowance, but then, you can do that with just about any pattern making method, and a lot quicker and cheaper the trditional way. When I was suggesting welded square steel tube base rather than the flimsy construction I've seen on some of these printers, the reference to router bases had nothing to do with precision. I was talking about simple constructional stiffness. the ways and bearings determine positioning accuracy, not the base that supports them. And for the moving gantry and parts I was talking abut reducing mass, not increasing it. I haven't seen very impressive work in the design of machines themselves in terms of an understanding of stiffness and damping. I've seen a lot of futuristic maker-culture design, which often seems to hint at a lack of basic design and manual metalworking fabrication skills. I think these mchines are fine if you enjoy modeling in plastic, but when people start talking about producing machine parts, I think there needs to be a shift in design understanding, not necessarily cost. I do believe that a machine to produce strong long wearing mechanical parts could be designed better, and not necessarily more expensively, and that was what I was suggesting. I have never been really excited about these hobby 3D printters. Too much hype. There are some mention and reference to anual make magazine 3D Printing Shootout, I found pretty nice "test". I don't knw how many makes are test. Unfortunately this is in Finnish, I could not simply click "English" to have these articles English, maybe google translator would do some kind of job? Hard to believe it. Maybe someting lost in "translation". Here is some more about 3d / lostwax casting.